I thought it was very confusing when I first tried to use manual setting circles. I first describe how to do this procedure very briefly and if you scroll further down, I have a longer section where a complete explanation is offered, with detailed examples and pictures. Set up Dec setting circles and right ascension circle. Swing the telescope over and center a bright star that you know the name of. You should be able to find the star both in the sky and on a star atlas that will give you its coordinates in Right Ascension (RA) and Declination (DEC). To find a new object with your telescope, find the RA and DEC of the object (for instance, the Ring Nebula, M57) in a star atlas or online. Without touching or rotating the setting circles (! ), move your telescope until the object's coordinates line up with the arrows on the RA and the DEC scales. The object should be pretty close in the field of a WIDE angle eyepiece (low power). I usually have to spend a few minutes hunting around in a spiral pattern for it though. Using an equatorial mount equipped with setting circles, you can "dial in" any object that you want to observe. To help you better understand the celestial coordinate system and setting circles, let's walk through an example with pictures and illustrations. We'll start with an example of an alt-azimuth mount and transform it into an equatorial mount and then move on to actual pictures of manual setting circles and what they would look like when pointed at certain objects. An equatorial mount is not as complicated as it seems or looks. Think of the most basic type of mount, an alt-azimuth mount. This is shown in the image above, labeled Fig. 1. This particular design is a Schmidt-Cassegrain telescope (SCT) on a fork mount. We are seeing it from the side, as it points to the left. The telescope can be moved up and down, and left and right to point at objects. Imagine that the telescope is parallel to the ground, basically pointing at something on the far horizon. Mentally spin the telescope, left or right, 360 degrees. Now think of an axis line going from the middle of the mount, straight up into the sky. The left and right motion of the scope pivots, or rotates around this vertical axis. Got it visualized? Now hold onto your hats for this next one. Imagine tilting the entire mount until the vertical rotational axis for left and right directions, is pointing at the North Star, Polaris (we would really point at the north celestial pole, but Polaris is close enough). See Fig. 2 above. This axis is now referred to as the 'polar axis' of the mount. The telescope still moves up and down, and left and right relative to its mount, but now the entire thing is tilted toward the North Star. This magically transforms the mount into an equatorial mount. Now moving the telescope "left and right" is moving it in right ascension (RA). If you move it "up and down" it is moving in declination (DEC). The mount's polar axis is aligned with the Earth's polar axis. It is now 'polar aligned'. If the telescope was pointed at the horizon when you "tilted" it over, the scope now points to some point along the celestial equator and at zero degrees declination. The only other thing to remember is that as you move toward the east, the right ascension numbers increase (until you hit 24, in which case you're back to your starting point of zero hour again, i.e. you've done a "360", a loop). So, if an object was defined as having a Right Ascension of 2h 30m and a Declination of 15deg 10m N, you would start at the zero hour of right ascension on the celestial equator and move east until you reach the 2 hour, 30 minute mark. Then, since the declination is North (if it had been marked S or with a negative, it would be south), you move up (north) from the celestial equator until you reach the 15 degree, 10 minute mark. There you will find the object. Now let's go through the exercise of actually locating an object using mechanical setting circles. Let's assume we have already set up our telescope and have it polar aligned. We have aligned the right ascension rotational axis, which is the polar axis, with the north celestial pole...you know, the tilt. We first need to calibrate the setting circles. Actually, we only need to calibrate the right ascension circle because the declination dial doesn't move. To visualize this, imagine you are standing facing due south with your finger pointed at the sky at about the 15 degrees north declination mark. Imagine you stand that way all night long. You will always be pointing at 15 degrees north declination, but as the earth turns and the sky slides by, the right ascension you are pointing at will be constantly changing. If you happened to be initially pointing at 4hr 30m right ascension, two hours later you will be pointing at 6hr 30m right ascension. Unless of course you move your finger to keep it pointing at the original spot, which is exactly what the clock-drive does on your mount. Since declination does not change, the clock-drive only needs to rotate the telescope about the polar axis, in right ascension toward the west, at the speed of one complete rotation every 24 hours. This precise speed will keep an object centered in the telescope. So, you really only need to calibrate the right ascension setting circle. The most common way of doing this is to point to a known object and rotate the right ascension setting circle dial until it matches the coordinates of this object. I keep a list of bright stars handy, along with their coordinates, for this purpose. The bright star Sirius's coordinates are approximately 6h 45m right ascension, and -16d 43m declination. I always round the seconds off to the nearest minute. To calibrate the setting circles, we would point the telescope at Sirius then rotate the right ascension dial until it reads 6h 45m. Let's assume the telescope is now pointed at the star Sirius. This is an image of my right ascension setting circle. It has been rotated so that the pointer is pointing to the right ascension coordinates of Sirius, 6h 45m RA. On my system, this is read on the outside ring of the dial. The inside or interior numbers are used if the observer is in the southern hemisphere. If I ever get confused, I just push my scope to the east and note which set of numbers has increasing values of RA. This is an image of my declination setting circle. By default, since the actual dial doesn't move, it will be pointing at the declination coordinates of Sirius, -16d 43m DEC. Notice the negative sign in Sirius' declination? That means it is below the celestial equator which is a southern declination. Visualize the constellation of Orion. Remember that the celestial equator runs through the belt. Where is Sirius? It's down and to the left of Orion, which means it has to have a southerly, or negative declination since it below the celestial equator. Now that the setting circles (really only the right ascension circle) are calibrated, the mount can be used to find an object. Let's imagine that we want to find the galaxy M65, located in the constellation of Leo. Using software, books, or whatever, we find that M65's coordinates are 11h 19m RA and +13deg 5m DEC. It's now a simple matter of just moving the telescope until the pointers are pointing at these readings on the setting circles. 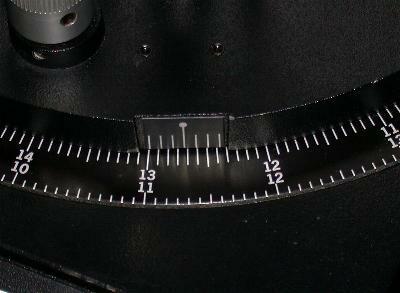 This image shows the right ascension dial once the telescope has been moved so that the pointer is aligned with the right ascension coordinates of M65, 11h 19m RA. Since my dial is in 5 minute increments, I basically interpolate where I think 19m point is. 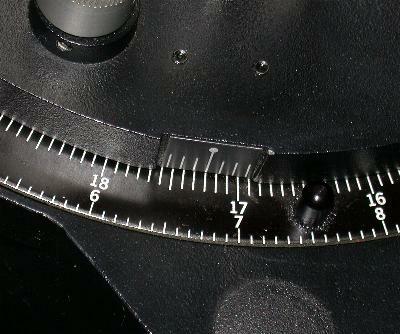 This image shows the declination dial once the telescope has been moved so that the pointer is aligned with the declination coordinates of M65, +. Since the dial is only in 1 degree increments, I basically interpolate where the 5m point is. If we did everything correctly, we should be able to look through the eyepiece of the telescope and see the galaxy M65. And if the telescope has a clock-drive, the galaxy should stay in the field of view as long as we want to observe it. When we want to observe another object, we just move the telescope until the pointers are pointing at the listed coordinates for the new object. What if the object is not in the eyepiece when you take a look? We'll assume that given the type of telescope and the sky conditions, it should be visible. There are a number of reasons why it might not be in the eyepiece. First of all, you could have made a mistake. You might have transposed a couple of numbers, or moved north when you should have moved south. Did you calibrate on the right star? Are you sure you have the right coordinates? 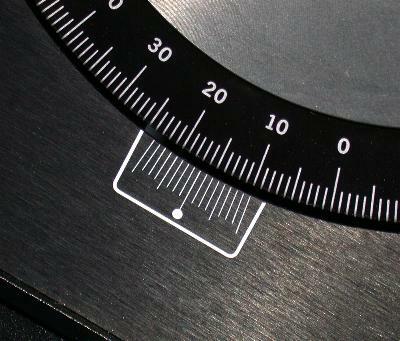 Are you using the correct, northern hemisphere right ascension dial? Assuming you have the right numbers, just take your time and dial in one coordinate at a time. I usually start by reading then dialing in the right ascension. Then I go back and read the declination, and dial it in. What if you have all the right numbers, and did everything by the book, but still can't see the object? Some mounts are more accurate than others. For example, my declination circle is only divided by whole degrees. That means I have to guess and estimate at where the minute markings are. This naturally introduces some error. Most of the time, if I'm careful the object is there when I take the first look. If not, it's usually within an eyepiece field of view away, so I just pan a little bit in declination, followed by right ascension. Use a low power eyepiece so that you have the widest possible field of view. 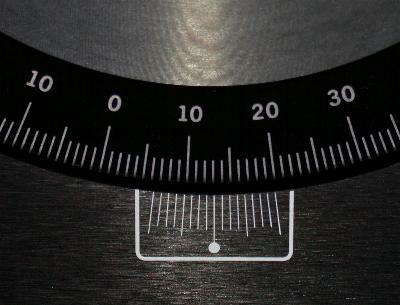 And of course, if your polar alignment is way off, that will affect your accuracy as well. Also, although you shouldn't have to worry with calibrating the declination circle, sometimes it is a little off when it comes from the factory. One way to determine if your declination circle is aligned properly is to move the telescope until it reads 90 degrees north. In the case of my telescope, that means the tube will be parallel with the forks. If I have an object centered in the telescope's field of view, like a star, and spin the telescope about the polar axis (i.e. in RA movement), that object should stay in the center. If it doesn't, then the telescope is not really pointing exactly at 90 degrees. To correct this, you would move your telescope in declination until the object finally stays in the middle of the field of view during a spin. Then you would adjust your declination circle until it reads 90 degrees. This should be a one time procedure. I haven't adjusted my declination circle since I initially did it a few years ago. What if you found the fist object okay, but when you decided to go for a second one, you missed? Assuming the miss is not because of a mistake or inadequately calibrated setting circles, it could be related to the type of mount and how the clock-drive functions. If your mount does not have a clock-drive, that means that it will not track to keep the object within the telescope's field of view. You'll have to move the telescope every now and then in right ascension (toward the west) to keep the object within the field of view. For every minute that goes by after initially pointing at the object, your right ascension circle will be a minute in error. So if you observe an object for 20 minutes, your right ascension setting circle will be off by 20 minutes. Before going on to another object, you have to recalibrate the setting circle. Just move the right ascension dial back to read the coordinates of the object you are viewing before moving to the next object. Even if you have a clock-drive on your mount, you may still have to perform this procedure. My SCT mount actually moves the right ascension dial as it moves the telescope so once I have made the initial calibration, I don't have to readjust it. Although I have noticed that sometimes during the night it will get a little off and I'll have to sync it up again. And if I just can't figure out why I can't find an object, I'll start over with pointing at a known star and making sure the right ascension setting circle is properly calibrated. Some mounts have better setting circles than others. I have found the ones on my SCT to be quite accurate. But with most people buying electronic GOTO telescopes today, they don't have much use for mechanical setting circles. Those that don't have GOTO scopes seem to rely more on star hopping as a method for finding objects. But setting circles can have their place. They are generally quicker than star hopping when going to a target that isn't sufficiently surrounded by bright stars. They are also helpful in crowded areas like the galaxy clusters in Virgo and Coma Bernices, where star hopping is more confusing because of the sheer number of galaxies. Then there's the satisfaction of using them. For me, finding objects with setting circles is the most efficient use of my time when observing. What ever your reason for considering the use of setting circles and celestial coordinates, I hope this article helped in some way.